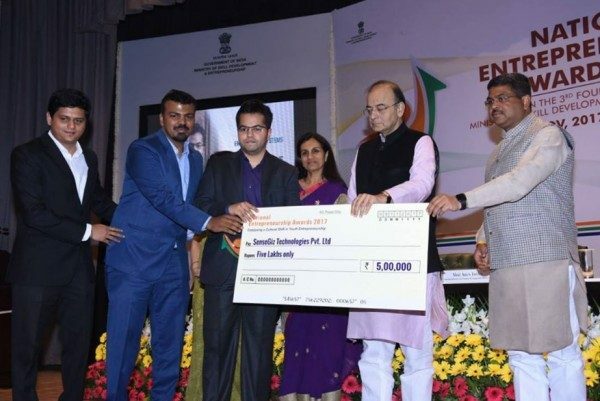 SenseGiz a Belagavi based IOT based consumer & enterprise products company has won the National Entrepreneur award under Engineering Systems from the Ministry of Skill Development and Entrepreneurship, Government of India! Chosen from over a 1000 companies. Abhishek Latthe Founder & CEO of the company with his team were honored in New Delhi recently. SenseGiz makes IOT based consumer & enterprise products for smart home/office, security, and smart city applications using a combination of connected hardware, cloud analytics & apps. SenseGiz’s primary focus is to design products that help keep our users safe, fit, happy and thus empowered.